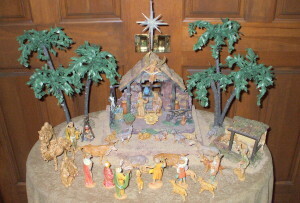 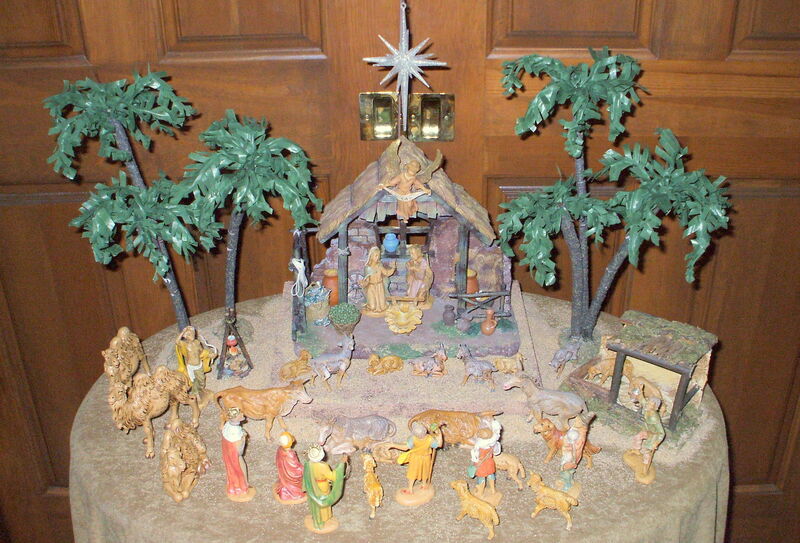 When we lived in California, I decorated our house for Christmas in a very different way from our Midwest home. 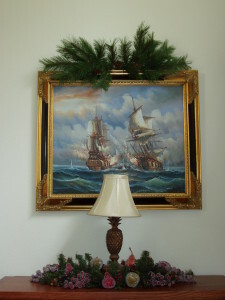 I used artificial pine garland in several of the rooms, including the living room, family room, dining room and kitchen. 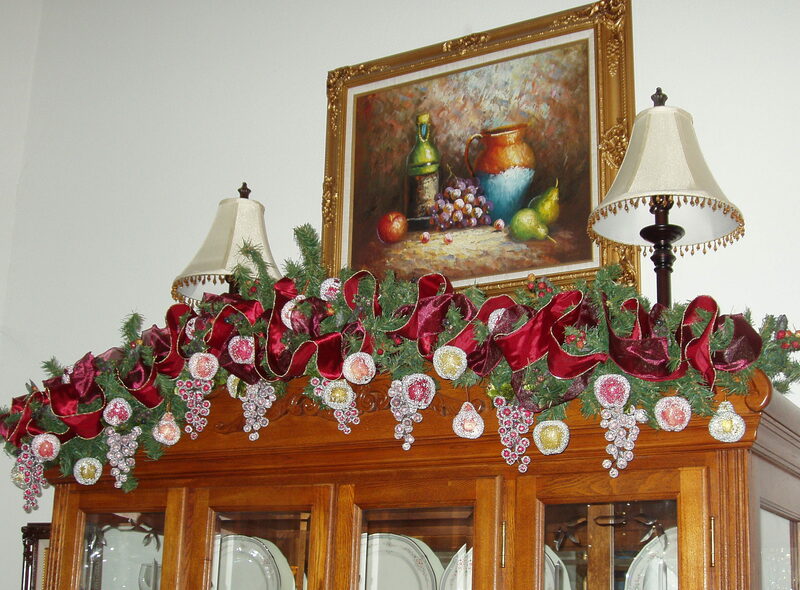 Pine garland is a wonderful Christmas decorating accessory to use and it can be very versatile with the use of different items added from one room to another to get a wonderful variety of looks. 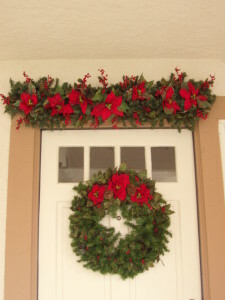 As I discussed in last month’s Décor post, Fall decorations, in our previous home in California I used several lengths of pine garland set up in both the living room and dining room decorations with golden roses, berries and oak leaves with pre-strung with lights because the intent was to leave the garland in place until Christmas. 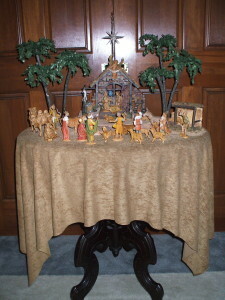 This was meant to save time during the holiday decorating process and the accessories in the garland would be changed from the Fall to the Christmas seasons. 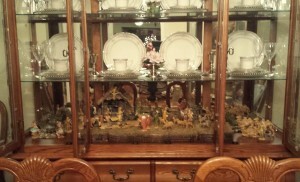 In both rooms there were large oak pieces of furniture, an oak entertainment center in the living room and an oak china cabinet in the dining room, and the garland was secured into place at the top of each. 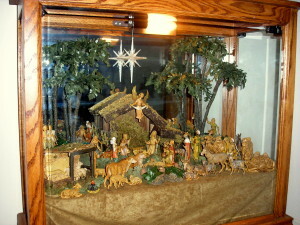 For the 2002 Christmas season, I removed the Fall decorations and added red poinsettias with red berries and holly leaves. The inspiration for this was a trip had recently made down to Encinitas, California to the Ecke farm that grows poinsettias which are marketed and shipped throughout the United States during the holiday season. 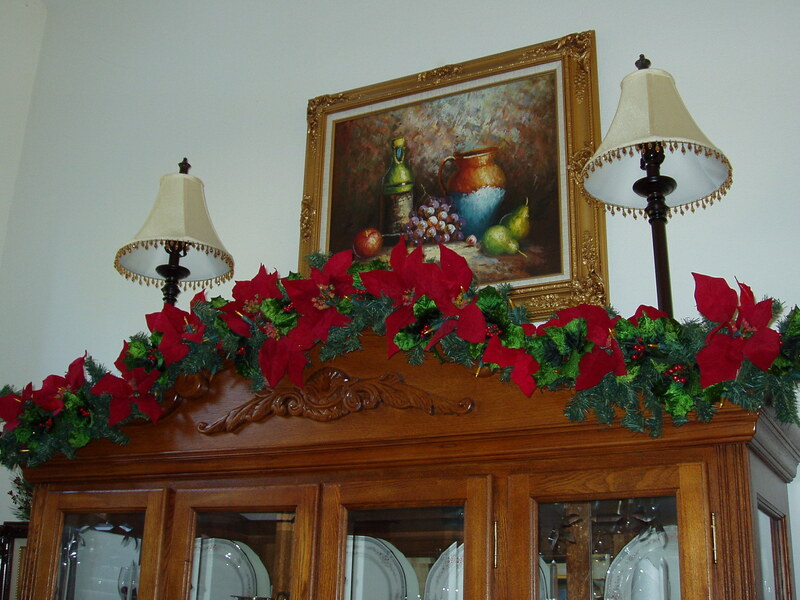 I started the arrangement by inserting several artificial poinsettias into the existing garland and in between the flowers I added holly leaves and red berries. The contrast of the green pine garland and the red poinsettias was very festive for Christmas. 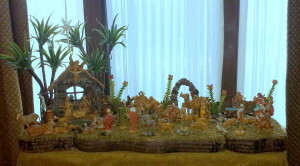 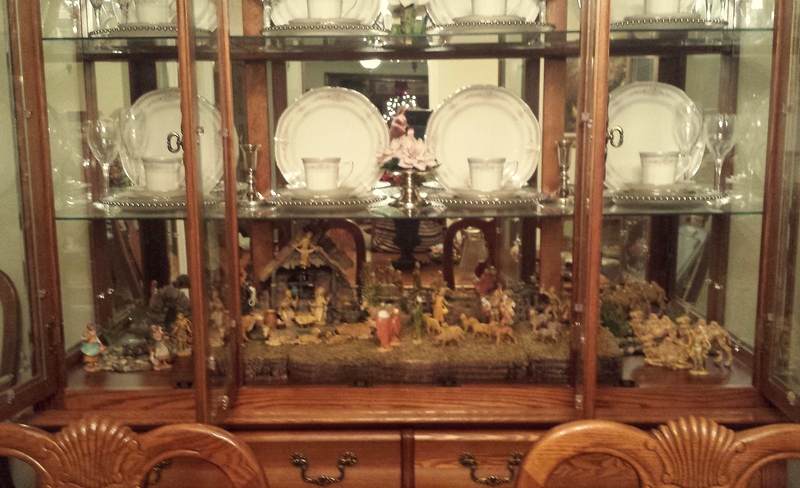 Both arrangements in the living room and the dining room used the same decorations. 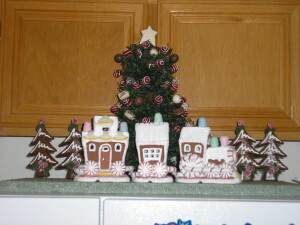 In our California home, I always decorated our kitchen with a gingerbread and candy theme for the Christmas season. 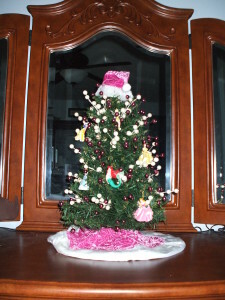 To start the 2002 decorations, I hung an artificial pine garland over the window. 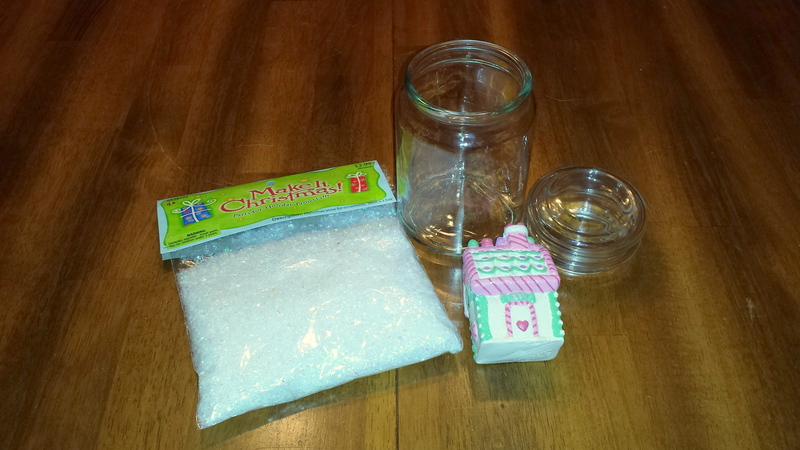 I had found various candy themed items in the local craft stores, such as artificial chocolate candies, white chocolate covered strawberries and white “Icing” snowflakes. 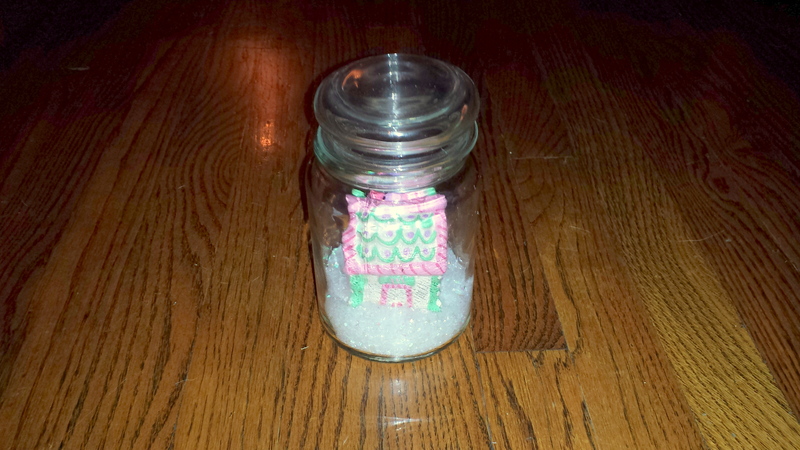 These items were secured to the garland and the decorations looked perfect for the kitchen. 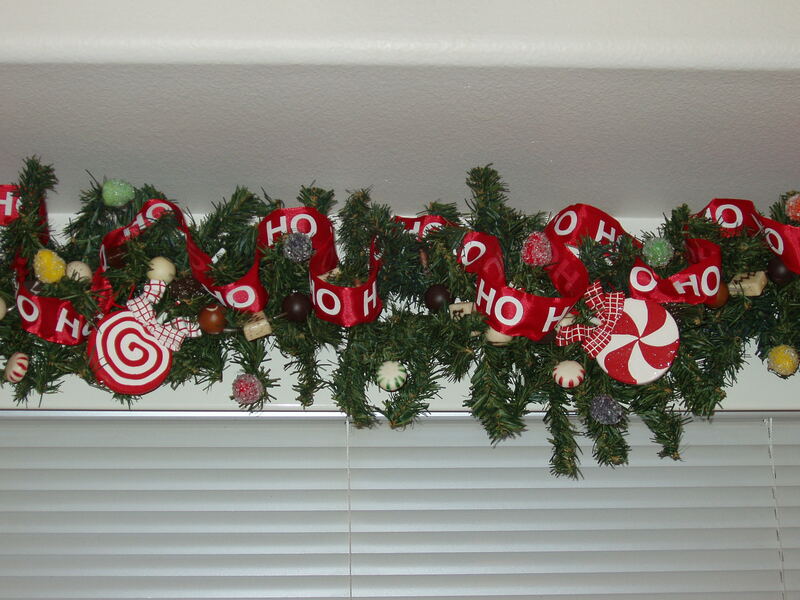 In keeping with my decorating style of constantly changing my holiday displays, for the 2003 Christmas I again used an artificial pine garland and laced a cute “Ho,Ho,Ho” red and white ribbon through the garland. 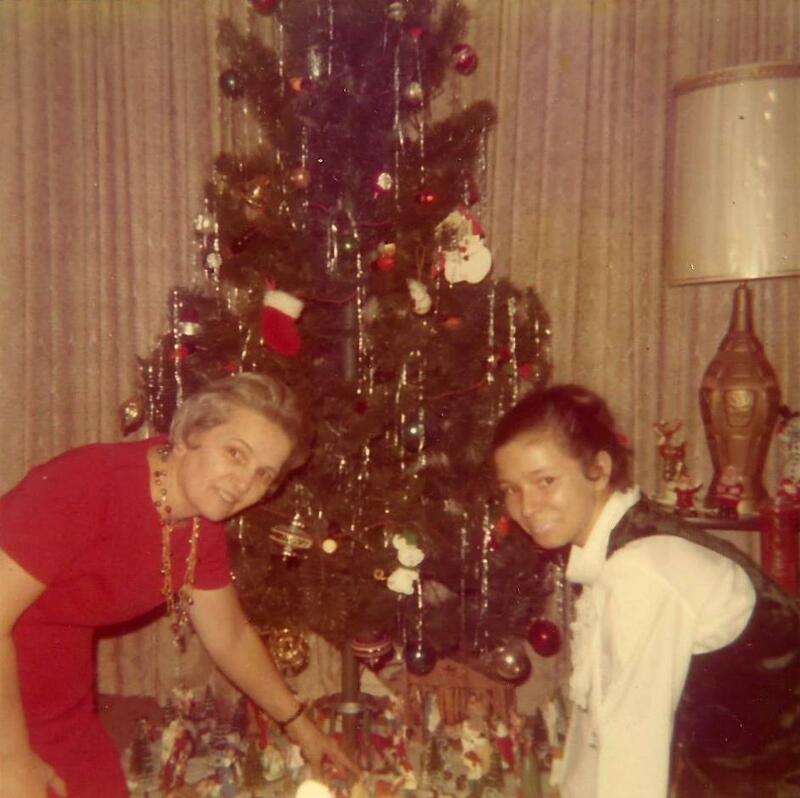 I still used the artificial chocolate candies but that year I added artificial gumdops, peppermint candies and red and white lollipops. All these items were secured to the garland and once again the contrast of red and green colors looked great for the Christmas season. As you can see for the photos of the kitchen garland for one year to the next, the same candy theme was used but with different accessories the garlands had to distinct and different looks. 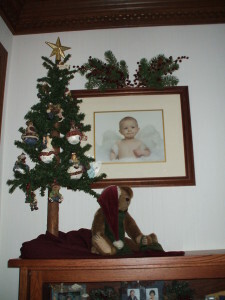 For the last garland arrangement in our California house, I used another artificial pine garland for the fireplace mantel, this Christmas decoration was featured in the Décor post, Displaying a Boyd’s Bear Collection – Part Two. I had found a string of amber pinecone lights in a local store and strung them through the garland. Next, I evenly spaced my collection of Boyd’s Bear ornament nestled among the pine boughs. 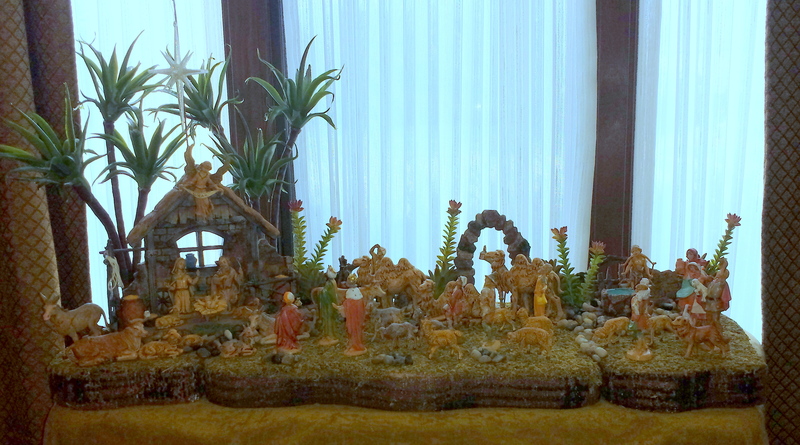 To finish the display I added several real pinecones and red berries scattered throughout the garland. 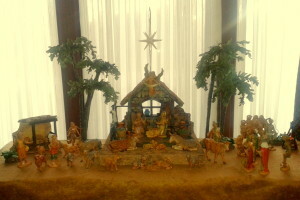 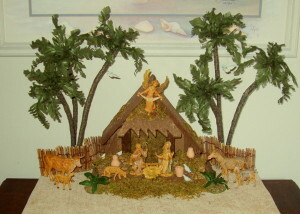 As you can see by moving from one house to another I adapted by Christmas decorations and used the items in new and different ways. 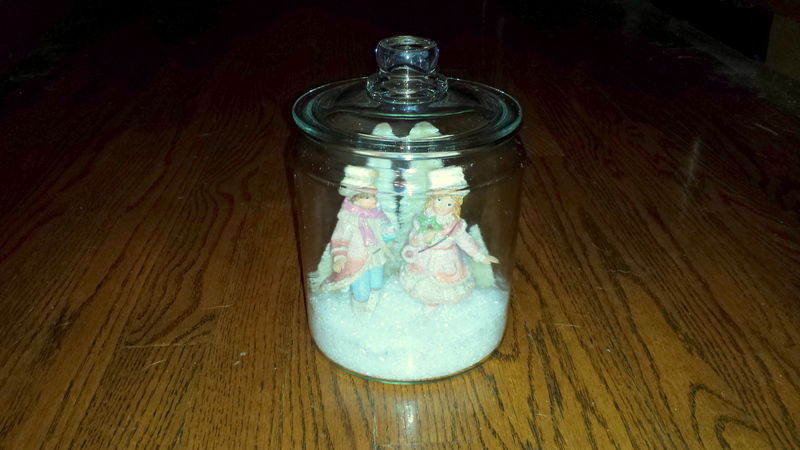 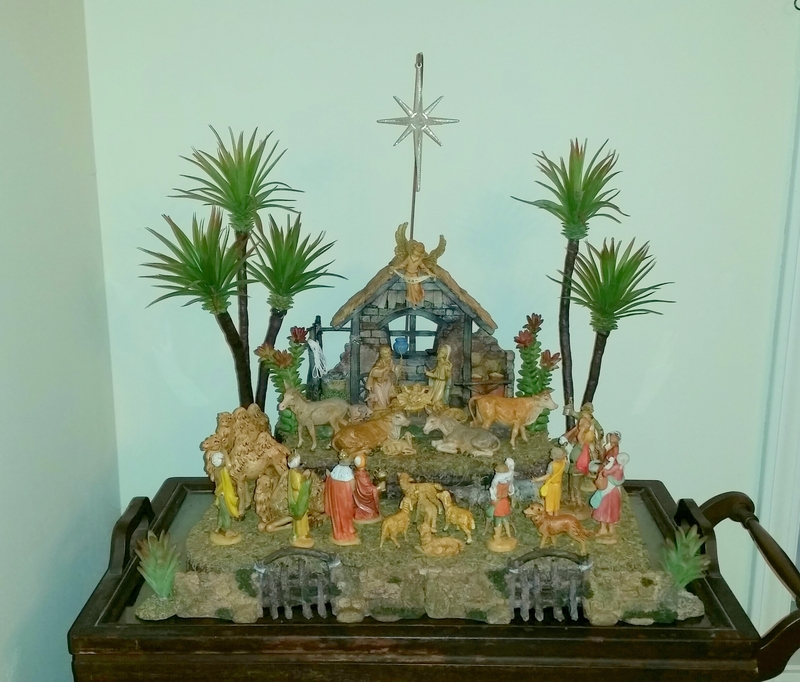 I hope this inspires you to take a look as your Christmas decorations as you unpack them from their storage boxes and think about displaying those items in fun and different ways in the rooms of your home. 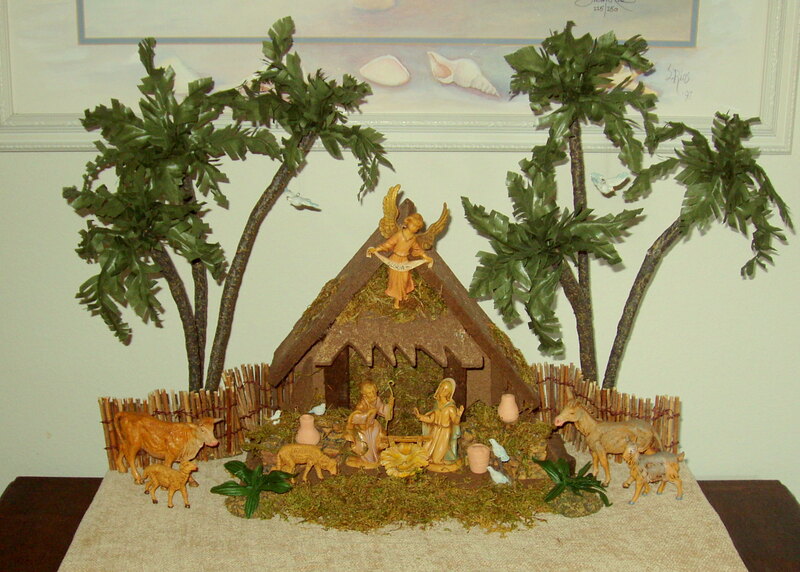 The week after Thanksgiving is a very busy time for me! 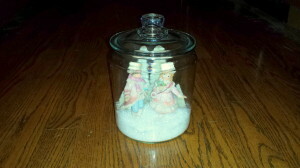 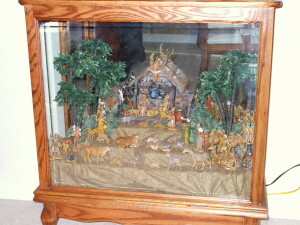 That’s when the Fall decorations are put away and the Christmas decoration boxes are brought up from the basement. 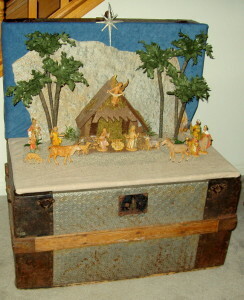 I really enjoy taking my time to unpack each box and deciding how I want to do this year’s displays. Even when I’m using the same pieces year after year I try to set my displays in different ways or in different rooms of the house. 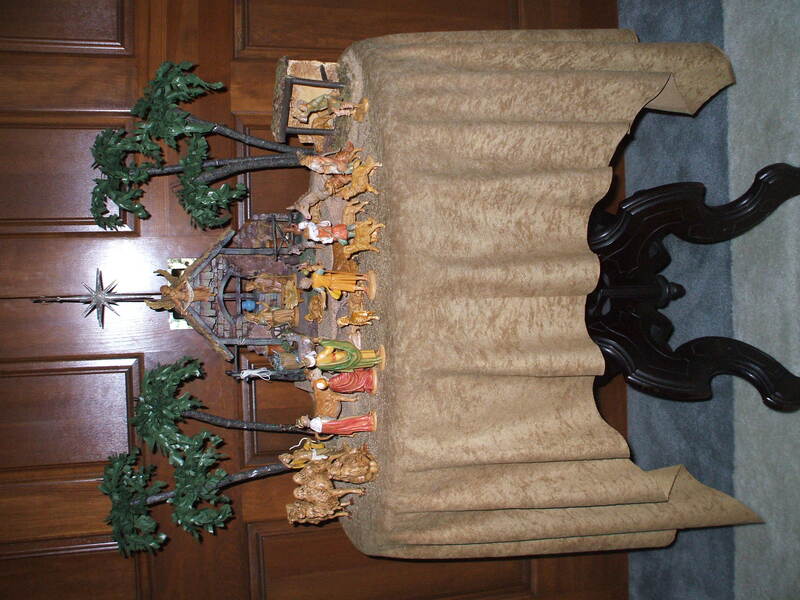 Sometimes the Fontanini Nativity set will be in the dining room and the next year it will be in the our library or the Department 56 North Pole Village will be in the family room bookshelf and the next year is will on the mantel over the fireplace. 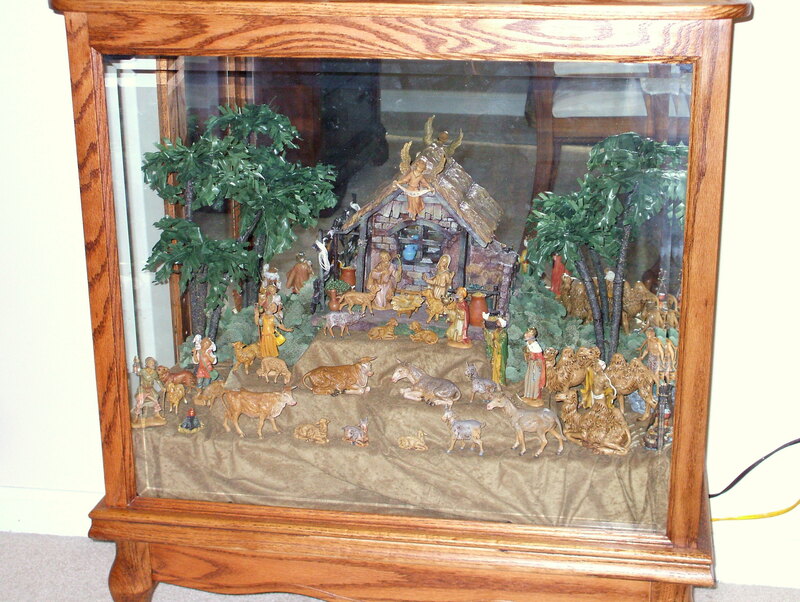 This keeps everything interesting and it is fun to use different ideas or techniques to set up the displays. 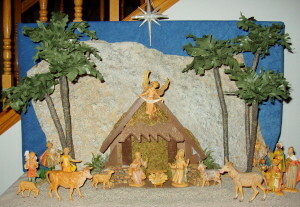 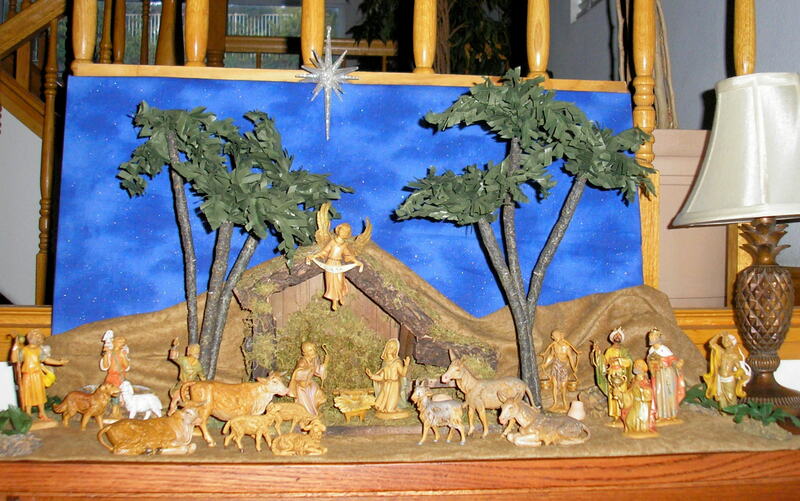 In upcoming December posts, I will take you through all my preparations of the different Christmas displays I create in our home, such as: Fontanini Nativity Display and Department 56 North Pole Village. 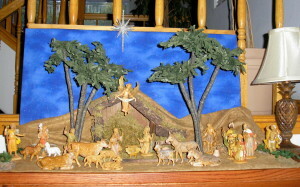 Some other December posts detail my other Christmas decorations, such as: Themed Christmas trees and Christmas wreaths. 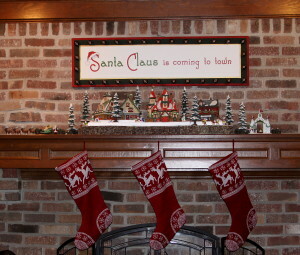 All of these Christmas decorations are created to make the holiday season a special one for my family. 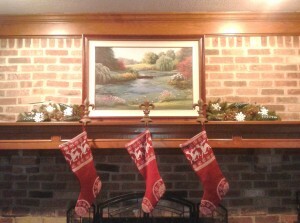 Pine garlands are a very versatile material for this purpose and I will show how with some simple changes it can be used for both Fall and Christmas decorations. 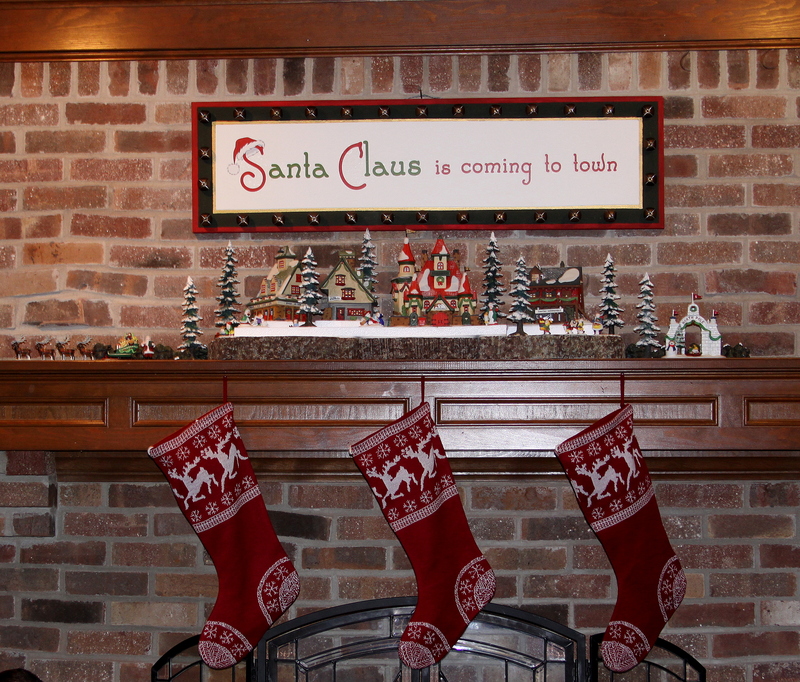 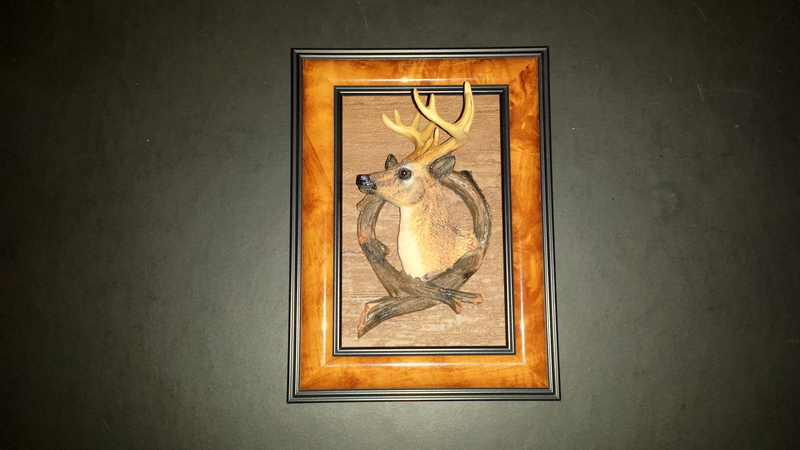 One of the most traditional ways to use pine garlands are on a mantel over the fireplace. 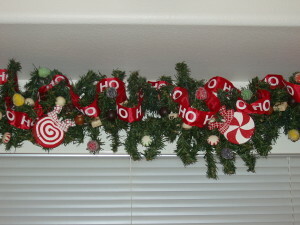 Below are two photos showing the same garland decorated for both holidays. 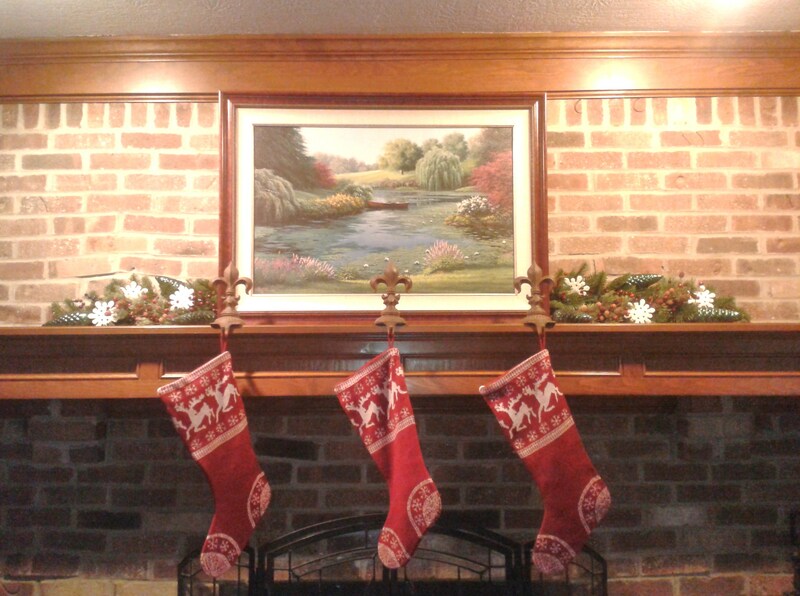 Keeping the same pine garland on the mantel, I switched out the fall decorations and replaced them with the Christmas decorations. 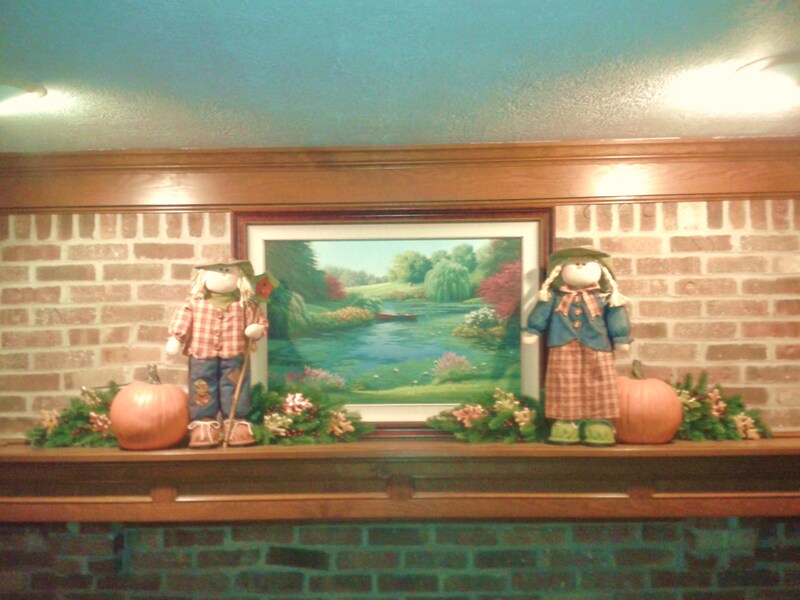 For Fall, the pine garland is decorated with colorful ceramic fall leaves and red berry sprays scattered throughout. 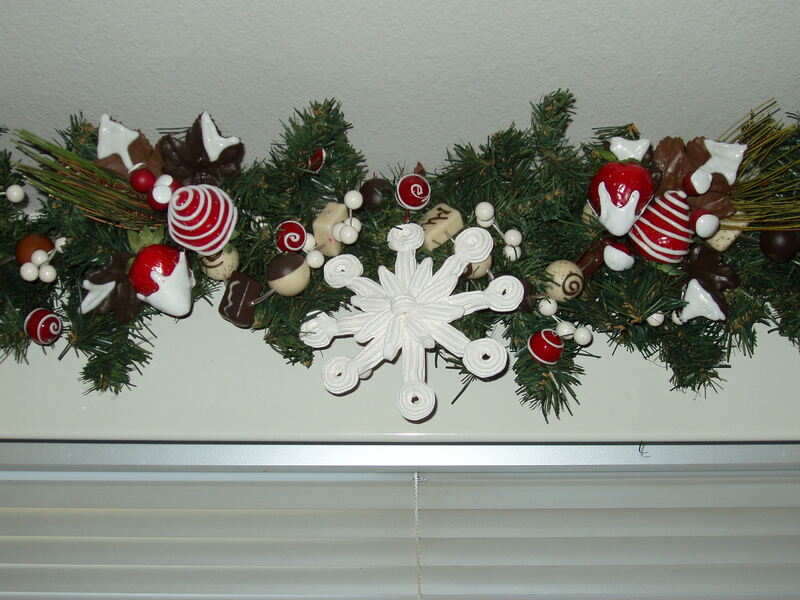 For Christmas, I used several ceramic snowflakes, large green glass pinecones ornaments and red berry sprays. 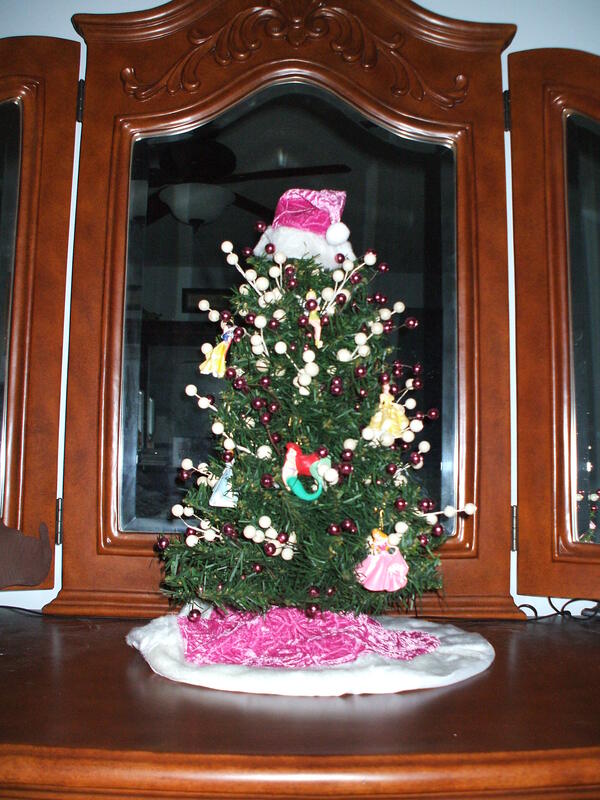 Small tabletop Christmas trees can be used in the same versatile way. In my dining room I create a “Memory Tree” and placed it on a tea table. 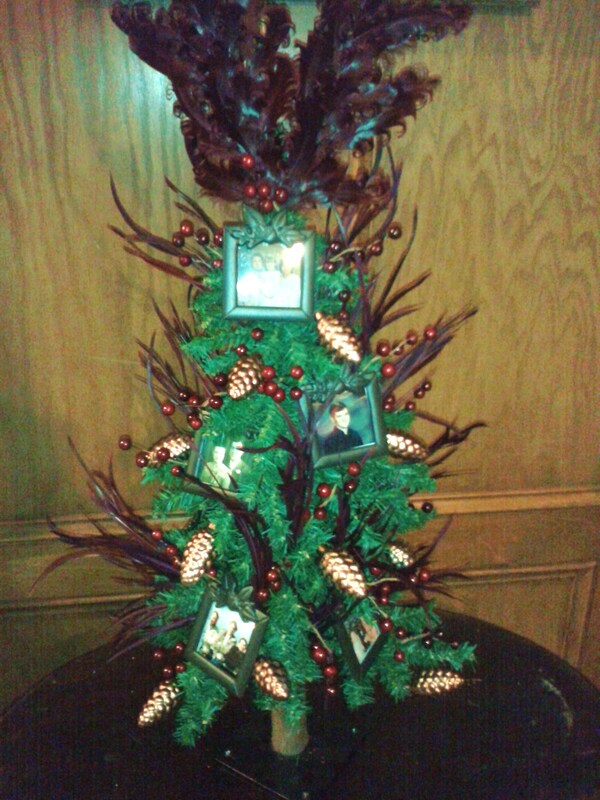 This special tree is decorated with family photos in small bronze photo frame ornaments. 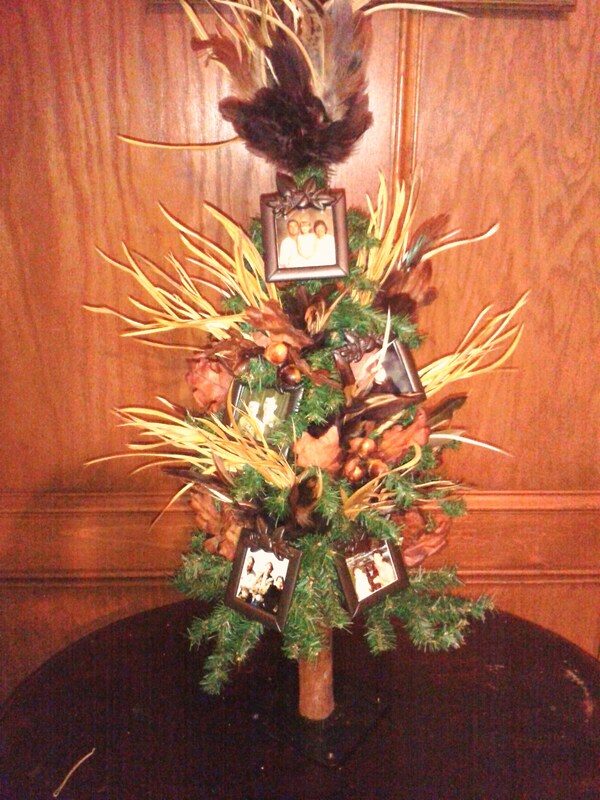 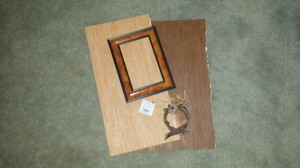 (Please see this week’s Craft post for more information on the Memory Tree or Wreath) Below are two photos showing the “Memory Tree” decorated in two different ways for Fall and Christmas. For Thanksgiving, the tree is decorated with golden feathers and oak leaves with acorns. 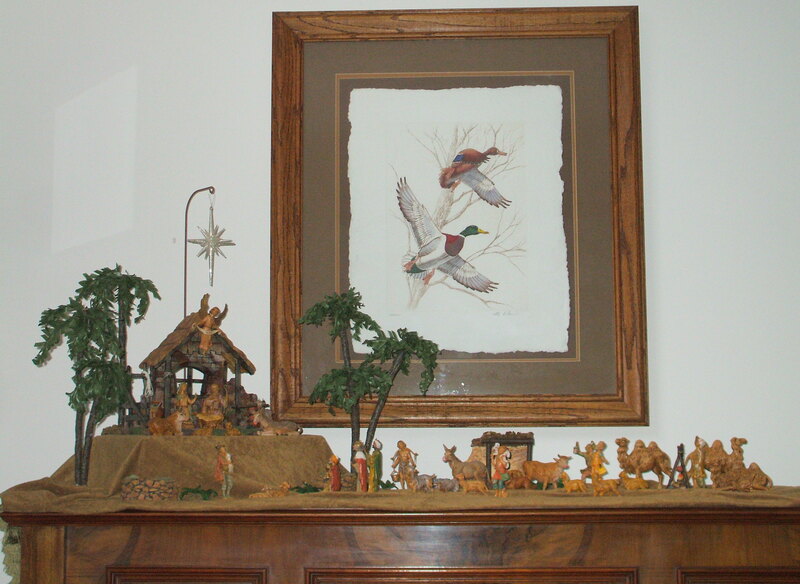 For Christmas, I replace the golden feathers with burgundy feathers and small glass pinecone ornaments. 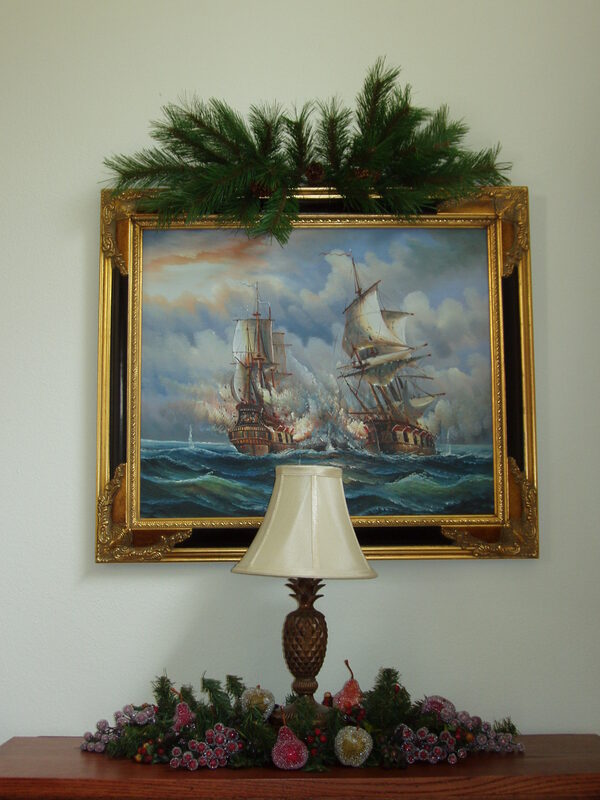 As you can see, all it takes is a little creativity and by simply using different decorations to accent a pine garland or a tabletop Christmas tree the look can reflect the different holidays. 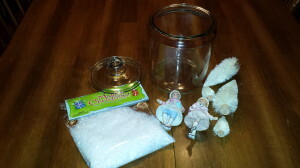 I would love to hear from you so, please write me to share your own ideas or comments.